Why Buy a Built-In Wine Cooler? For the serious wine collector, traditional wine racks cease to be good enough at a certain point. When you’re buying expensive, sensitive wines that need just the right conditions for aging for you to get the full benefit from them, you need a way to store your wine bottles in a more carefully controlled setting. Wine coolers are specifically designed to keep your wines at the perfect temperature for optimum aging. For many homes though, finding a spot to put a whole extra refrigerator in can be a challenge (even as many wine coolers are on the smaller size). 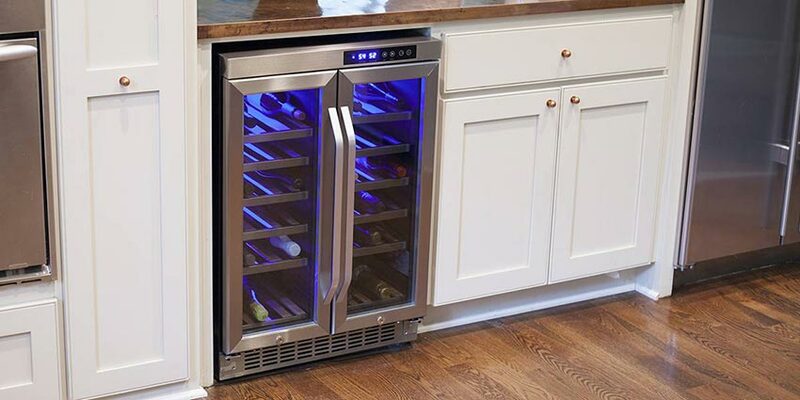 If you’re remodeling your kitchen, building a new home, or tired of that trash disposal no one uses taking up valuable undercounter real estate in your home, then the easy answer becomes to buy a built-in wine cooler. Built-in wine coolers can be installed under a countertop or desk without any concern for overheating. They’ve become an increasingly popular option in recent years for wine collectors that want to make sure their wines are kept in the best possible condition before they open them and like the idea of a permanent solution that’s part of the house. Wine coolers don’t just keep wine cool; they keep the humidity regulated and keep out some of the light that can harm wine. Kitchen refrigerators are colder than is ideal for storing wines and let too much humidity in. And in most homes they stay full enough without having an extra storage job to do. Undercounter wine refrigerators typically involve more work to install than freestanding models and are more expensive, but they become a more integrated part of your home. If your kitchen’s already crowded, they also help you save on floor space and ensure the fridge stays tucked away where no one will bump into or trip over it. You don’t have to be a serious collector for a built-in wine refrigerator to make sense. Even for wine lovers that don’t reach that point of connoisseurship, built-in wine coolers can be useful for keeping a few extra chilled bottles on hand for when you have guests coming over. Built-in wine refrigerators all work according to one of two types of technology: thermoelectric cooling or compressor cooling. Thermoelectric wine coolers are popular for using a technology that’s much quieter than compressor refrigerators. They also provide the added benefit of using less energy. If you already have a lot of noisy appliances in your life, they can save you the trouble of one more. The downside is that they’re not as powerful. If you need an undercounter wine fridge that can handle cooling a large capacity of bottles, or if your refrigerator will be in a space where it will be exposed to heat, then a thermoelectric model will have a hard time doing the job you need it to. Compressor wine coolers use the same technology that your kitchen refrigerator does. That means they’re often loud, vibrate a bit, and they use a lot of energy. On the plus side, they’re powerful. A hot day isn’t going to throw them off and bring the fridge’s temperature up. They work more consistently and they can handle tougher cooling jobs. If performance is more important to you than the inconvenience of noise, then a compressor wine cooler is your best bet. In addition to deciding between thermoelectric and compressor models, you have a wide range of other factors to consider in your search. Your needs should shape your search for the right undercounter wine cooler, so it helps to have a clear idea of what you’re looking for before you dive into browsing. Here are a few of the main categories and specifics to consider as you look. Before you go any further, you should have a clear place in your home in mind for your built-in wine cooler. With freestanding models you have a little more flexibility in figuring out where to put them, but built-in wine coolers are meant to be installed in a specific space, usually under a counter, where they’ll stay and become a fixture in the home. That means, most of the time when people choose to go with a built-in wine cooler it’s because they’re building a new home, remodeling their kitchen, or bought a home with a trash compactor they never use. If you fall into the first two categories, then you have some room to be picky in terms of size and dimensions since your contractors can build around whatever you buy (although you do want it to work with whatever you have in mind for the rest of the kitchen). If you’re replacing a trash compactor or undercounter wine cooler that’s stopped working, then you’ll have very specific dimensions you have to work within. Make sure to do your measurements so you end up with a built-in wine refrigerator that fits in the space you have available. Built-in wine coolers can vary in price from around $300 to several thousand dollars based on the size, style, and features you go with. Keep in mind that installation costs will often add a bit extra to the overall upfront costs as well. Higher-capacity wine refrigerators tend to cost more than those that just hold a few bottles and models that pack in extra features like a security lock or touchscreen usually cost more as well. If you’re storing sensitive bottles that you’ve made a big financial investment in already, then spending enough money to make sure that you buy a built-in wine cooler that works consistently, will last, and provides all the features you need is a smart investment since it will protect your other investments. If you’re mostly treating it as extra storage space for beverages rather than a way to store expensive wines at the optimal temperature, then you can more safely go with a model on the more affordable end of the spectrum – assuming it still provides the look and features you need. Capacity’s one of the most important factors to consider when looking for an undercounter wine cooler. 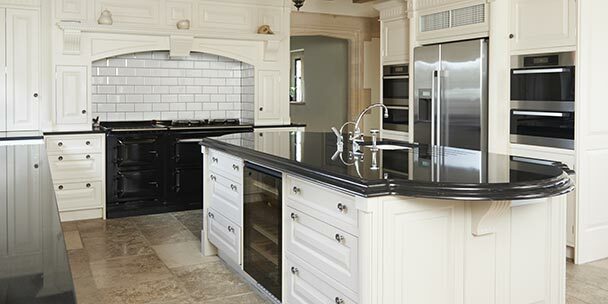 In many kitchens, you’ll be limited on space and may have to stick with a smaller model. But if you’re not constrained on space, then you should focus on how many bottles you want to store at a given time. Manufacturers consistently list the number of bottles that their wine coolers can hold, but be aware that usually the numbers they provide are specific to Bordeaux-style bottles. Since bottle sizes vary based on the type of wine you’re buying, what you can fit in your undercounter wine cooler at any given moment will change based on which types of wine you have. If you have a certain number of bottles you know you need to be able to fit into your wine cooler to be satisfied with your purchase, then the smartest move is to go with a wine cooler that claims a number higher than the number you have in mind. That will leave you some wiggle room for fitting bottles of pinot noir and champagne alongside the skinnier Bordeaux and riesling bottles. Many built-in wine coolers will come with one zone, which means all your bottles will be kept at basically the same temperature (with some slight fluctuation between top and bottom since heat rises). Some wine coolers – usually larger ones – offer dual zones. That means that you can store your red wines at a different temperature than your white wines. Any collectors that love both red and white equally likely already know that the ideal temperature for storing each is different. Dual zones make it easier to take care of both sets of wine without having to buy an extra fridge. If your only priority is proper storage, then you may not need to concern yourself with style. But if you want a wine cooler that looks good too (and why wouldn’t you? ), then you have plenty of options to choose from that look great. Many built-in wine coolers come with snazzy LED lighting that enhances their look. And you can find wine coolers in different colors, so you can pinpoint which will fit in best with the style of the rest of your kitchen. When it comes to looks, everything’s subjective. Do some browsing and see if anything pops out at you visually. Then picture any built-in wine cooler you like in the space you’ll be installing it. Will it blend in with the rest of the room? Or does it stand out in just the right way? A built-in model comes with a certain amount of permanence – you’re not committing to it forever, but you’ll want to hang onto it for a good long while. Make sure you’re happy with how it looks before you go to the trouble of installing it. Our lives are filled with noisy appliances as it is. Can your home handle one more? As previously covered, thermoelectric wine coolers are predominantly chosen specifically for being quieter. 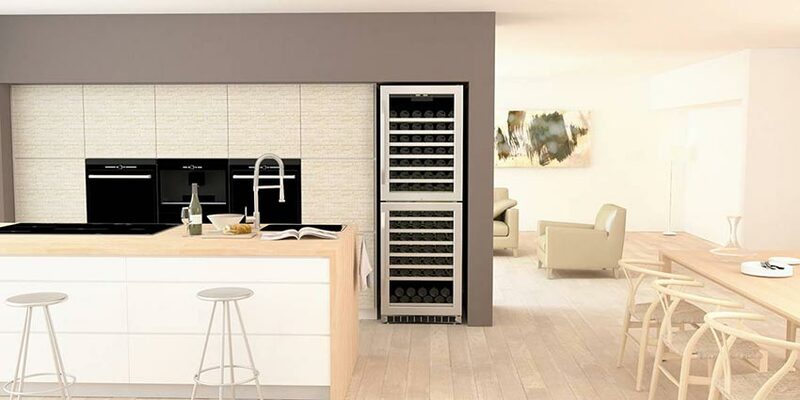 If you live in a home that stays well air conditioned throughout the summer or aren’t too concerned about the consistency of the temperature in your wine cooler, then you may find it easy to sacrifice those benefits for a quieter wine cooler. If your priority is keeping especially valuable wine bottles properly chilled, then you should stick with a louder compressor model as a tradeoff for better consistency in the face of higher outside temperatures – especially if you live somewhere where your home often gets hot. No one wants to spend money on a wine cooler that doesn’t last, and that’s especially true if you’ve gone to the trouble of having it built into your home. The best way to get an idea of what to expect from the durability of your wine cooler is to research the brand reputation and read the reviews on the model itself. You may find you need to spend some extra money now to ensure that you invest in a wine cooler that’s made to last. If doing so can save you the trouble of a break in storage time (possibly ruining or hurting the wines you’re storing), the cost of a new wine cooler, and the trouble of having to uninstall and reinstall a new fridge all over again – a few hundred dollars more right now starts to sound like a much better deal. Any type of refrigerator you buy will use a lot of energy and undercounter wine coolers are no exception. You should expect an uptick in your energy bill no matter which model you buy, but some will cost you less in energy over time than others. Thermoelectric models are known for using less energy than their compressor counterparts. As you’d intuitively expect, smaller, lower-capacity wine coolers use less energy than large, high-capacity ones. And you can find some models manufacturers have worked to make more energy efficient that they market as such. If you’re storing expensive wines and want to make them harder for thefts (or confused visitors) to access, a security lock is a useful addition. A touchscreen temperature display lets you monitor and control the temperature from without so you don’t have to open the door and influence the temperature consistency each time you do so. 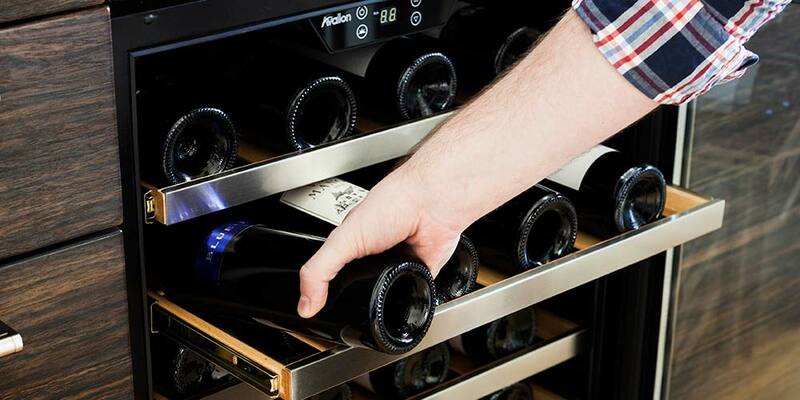 Extension shelves make it easier to access wines in the back of your undercounter wine cooler and see the labels when you’re deciding which one to open. LED lighting makes it easier to see your wine and also adds to the style of the fridge. 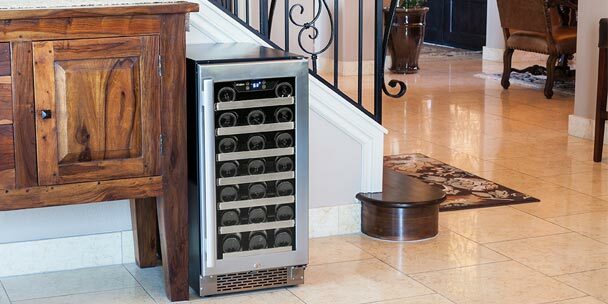 When you buy a wine cooler, you’re aiming to buy it for keeps. Identifying a brand with a solid reputation for building wine refrigerators of a high quality can pay off in years of perfectly stored wine. To help you navigate the wide world of undercounter wine cooler brands, we looked at the user reviews for wine fridges made by many of the most popular brands in the industry. Here’s a summary of what we found people saying about each. Avallon sells a number of built-in wine coolers in various sizes, several of which can also be used as freestanding wine coolers instead if you prefer. Most of their models get strong reviews from customers that say they’re quiet, they work well, and that they have great features that customers appreciate – in particular, several mentioned liking the extension shelves that make it easy to pull out a shelf and see all your wine bottles. A couple of their models received less positive reviews than others, with some complaints about wine fridges being too loud or not fitting enough bottles well. The negative reviews were in the minority and only showed up for a couple of particular fridge models, so most of Avallon’s wine coolers are a safe bet. You can check the customer reviews of the particular model you consider in advance to make sure you’re going with one that customers are happy with. Avanti’s undercounter wine coolers receive mixed reviews. The general takeaway from reviews of their various models is that customers love the wine coolers themselves – they look great and work well, but if they ever need a replacement part or a repair, then they have a hard time getting help from the company. Danby sells a range of built-in wine refrigerators in various models and sizes. Most of their undercounter wine fridges earn rave reviews from customers. They say they’re quiet, keep the temperature consistent, and are attractive. Many commented on how great the value Danby offers is for the price. Amongst the many models we looked at reviews for, one had complaints for not lasting very long, but most others had reviews from customers who had owned their wine fridge for years without trouble. The vast majority of built-in wine coolers sold by Danby are reliable, but you might check the reviews for the specific model you hope to buy just to make sure you’re getting one of the models customers love. 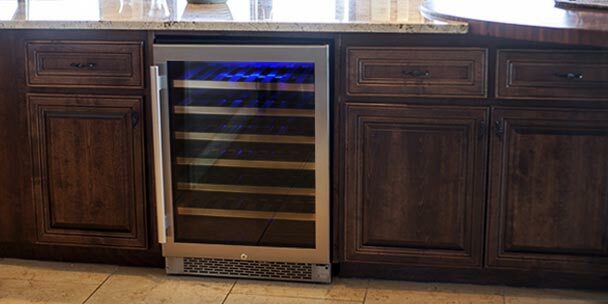 EdgeStar offers a wide assortment of built-in wine coolers in different sizes, styles, and types. In general, the user reviews for their undercounter wine refrigerators are positive. Customers find that they work well, cool wine quickly, are stylish and offer a good value for the money. The main negative mentions we encountered were some complaints about the noise the models make and others about the capacity of the fridge being different than advertised based on the type of wine bottles you have. Other than that, users are pretty consistently happy with their purchase. 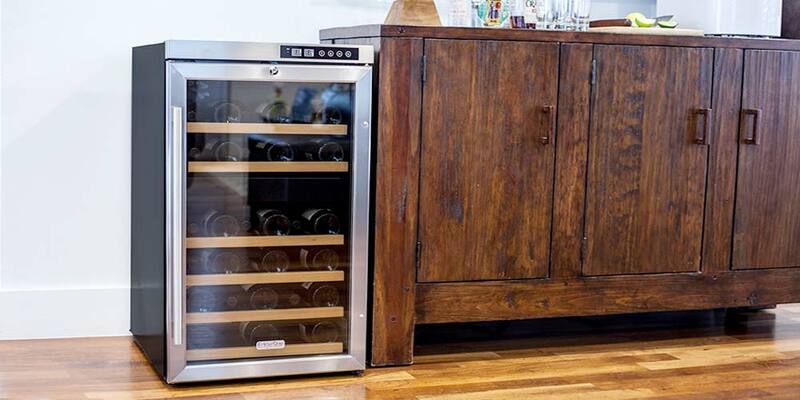 Koldfront makes a 30-bottle built-in wine cooler that customers are largely happy with. They say it’s easy to install, starts working fast, and looks good. The main complaint that came up in some reviews is that the unit can get loud. If you can handle the noise though, most reviews point toward a high likelihood of satisfaction. Magic Chef sells undercounter refrigerators that hold both wine and other types of beverages. Most reviews of their fridges are positive, saying they look good and work well. One reviewer mentioned appreciating the ability to switch out racks and shelves in order to tailor the fridge for the types of drinks needed. One of their units received some complaints for not getting cold enough, but other than that customers are generally happy with their purchases. Summit offers a wide variety of built-in wine refrigerators. With so much variety in the models they offer, many reviews focus on product-specific features, but customers pretty commonly find their fridges beautiful and well designed across models. The main complaints we came across come up often in wine fridge reviews: that units don’t fit the advertised number of bottles unless you only have bottles of a certain size, and some customers found their fridges to be noisy. In general, customers are happy with their Summit undercounter wine coolers, but since there are so many differences across models, this is a case where it’s smart to check out some of the reviews for yourself to get a clearer picture of what to expect from the particular fridge you hope to buy. Vinotemp’s built-in wine coolers earn mixed reviews from customers. Many say they cool wine well, look great, and are a good value for the cost. Some others say their units didn’t last long and they had trouble finding someone to repair it for a reasonable price. All told, the jury’s hung on their models and you should consider checking out the reviews for specific units to see what you think. From the devoted connoisseur to the homeowner who likes the idea of having a place for extra beverage storage, built-in wine refrigerators can be a useful addition to your home. You can protect your investment and make sure those expensive wines you buy taste just right when it comes time to open them, or you can easily keep some extra chilled wines on hand for when you have company over. Whatever your particular priorities, the right undercounter wine cooler is out there. You just need to get out and find it. 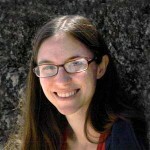 Kristen Hicks is a copywriter and lifelong learner that turns her curiosity toward exploring a number of interesting and educational subjects for WineCoolerDirect.com readers. She lives in Austin, TX with an excitable dog, an ever-growing book collection, and a (usually) well-stocked wine rack. You can find her on Twitter at @atxcopywriter. Hi Kristen – I am remodeling my kitchen and want to add a wine cooler (built in under cabinet). The frustration is finding a 24 inch wide 2 zone that gets decent reviews. If t you have a suggestion, please let me know. I was first expecting to spend around $800-$900, but with so many reviews commenting on many repairs and simply stop working, I was thinking of one in the $350 range and replace as necessary. Thoughts?